Hey crafty friends! 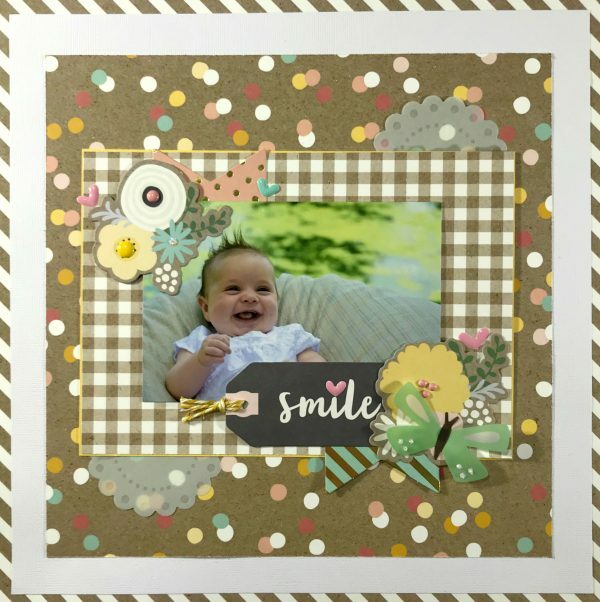 Thank you for joining me today for another baby girl scrapbook layout. I created this layout for the Bling On The Crafts blog hop. The links for all the other crafts will be below, but you can expect all types of sparkle from each one! For my project I used a photo from our baby girls 3 month photo shoot and the Pebbles Spring Fling Collection. I’ve had this collection for probably two, almost three, years and it was perfect for this outdoor photo. My bling for the hop came in the form of gold foil on both the pink and green banner pieces. I also added stickles to the center of the turquoise flower in the top cluster, and the wings of the green butterfly. The three pink hearts spread around the page are also shiny. I also created a youtube process video for this layout if you’re interested in watching. Thank you for joining me today, and be sure to check out all the other wonderful projects the other bloggers created for this! I love this layout. I am a huge fan of polka dots. It almost looks as if you had painfully glued confetti to the layout, lol. The hairstyle of your little daughter is super cool! Almost like mine nowadays. Oh my goodness – can you imagine having to glue all those tiny pieces! As for hair – go on my Facebook page and look at Michael when he was little. His hair grew straight up! I love the color scheme for this layout and all the little flower accents are so pretty! Oh I just LOVE that! I used to be such an avid scrapbooker.. but I have been quite unmotivated to make any pages lately. Pinning this for some much needed inspiration. I am so glad you found inspiration in this page! I hope you get back to creating pages soon and if you need any help or ideas I’m always here. Cute baby girl!! Love the layout! What an adorable child! Love the sparkle on your layout! This is a beautiful scrapbook page. I love all the flowers and the cute tag. Love watching the video and the process. I used to scrapbook, but haven’t done it in years. It sure has come a long way with all the products to make the pages pop.